To travel intentionally. What do I mean by that? I want my journeys to be purposeful, thoughtful and deliberate. I want to make the most of my time and my investment of resources in a trip. I know in the past I have missed moments, experiences and meaning in the midst of being overwhelmed by inconveniences; or from stiff, sore muscles that I typically experience due to travel and/or lack of rest. I always travel with fibromyalgia, so I have to think ahead. To travel intentionally. One way to do this is to prepare mentally, physically, and emotionally before heading out. Here are some ways I get ready. I can travel more intentionally if I anticipate my physical needs and take my comfort items, which let me stress less: water bottle to fill, snacks, meds, blanket or scarf, pillow, and NOT too much stuff that I will weigh me down. I can travel more intentionally if I read about the places we will see, much like I did last year when we went to Peru to visit friends. I like to do Internet searches and to read about the sites and the history behind them before arriving. In this case, I bought a tourist book on Peru. I, also, enjoy reading a book by a local or national author that gives me a feel for the culture. 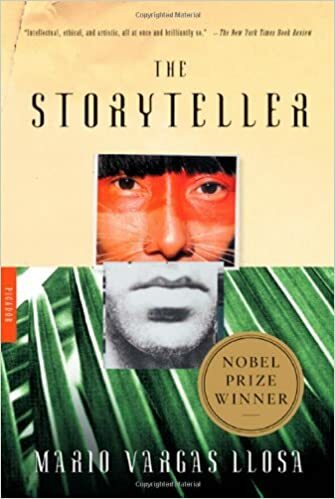 Last year before leaving I read, ­­­­­­­­­­The StoryTeller by Mario Vargas Llosa, a Peruvian classic. If possible, I will visit a native from that country or someone who has been there recently. The thing we rarely do to enhance intentional travel is to anticipate things about ourselves that may influence the trip. For example, are we open to meeting all kinds of people? Are we willing to try our little bit of Spanish (or whatever language) while there? (I’m particularly bad about this.) Are we ready to stretch ourselves by volunteering in the place and putting ourselves in unknown situations? Are we open to trying new foods, especially raw or totally unexpected and unfamiliar items? And are we willing to prepare ourselves with spiritual awareness that we may need, like patience, tolerance, acceptance, listening, and/or compassion? Journal writing techniques range from simple (summarize each day in 5 sentences) to standard (record what you saw and did) to more inclusive (capture your reactions, emotions, or fears to what occurred). Seize the day’s events, using all the senses. Ask others to write their view of the day’s events in your journal. I could go on and on. TRAVEL TOUCHSTONES WORKSHOP COMING UP! I use creative journal writing prompts to help me and others to become more conscious and deliberate in preparation for intentional travel in a three-hour workshop, Travel Touchstones. It offers travelers three major things to better prepare them for capturing the moments and mood, the mystery and magic of their sojourns. 1) Introduce anticipatory questions that will help focus on the upcoming journey. EXAMPLE: If visiting one country what questions (and of whom) can I ask to learn more about the country’s political system and how it affects global relationships? 2) Discuss kinds of travel and what journal writing supplies fit with each. EXAMPLE: If traveling to the boundary waters for a nature excursion, what special writing materials will you need in that environment? 3) Offer journal writing techniques that fit various environments and personality types. EXAMPLE: What theme will be of interest to you in the area you are going to visit and that you plan to write about every day? Food, architecture, education, or ways people dress culturally? October 22, 2016 from 9:00-noon at 18 Antelope Trail, Kerrville, TX. Registration fee: $65.00 includes refreshments and materials. Leave questions below in form. 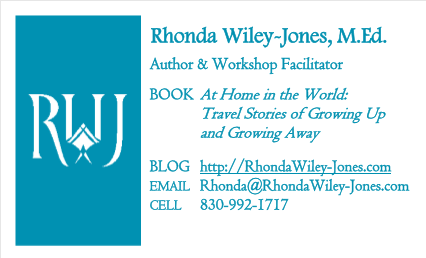 Rhonda Wiley-Jones, 18 Antelope Trail, Kerrville, TX 78028. I have learned that pre-travel groundwork puts me on high alert for what actually happens, whether it is what I expected or not. I experience more by this preparation. Some of us are up for anything; but most of us hold back in one area or another that may keep us for gaining the most from our travels. For those of you who live in the Texas Hill Country, don’t miss this three-hour, fun-filled workshop full of ideas, writing and sharing.